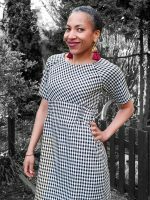 Check out this fabulous adaptation of the Everyday Chic Dress by my favourite Texan sewist, Mollie Moxie. 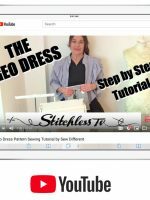 I always send my sewing patterns to Mollie to test run and this time she has come back with a great hack on my original design. 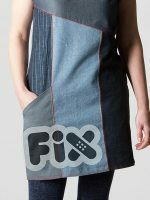 The added ruffles on the hem and sleeves and open neckline give it a completely different look. I LOVE her new romantic take on the dress in this sizzling pinky red. 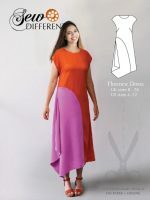 The original Everyday Chic Dress shown here is available as a multisize pattern on paper or as a download. 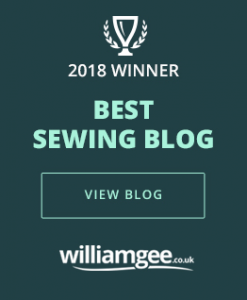 Have a look at my blog post to see it made up in different fabrics! Now for confession time! Mollie admitted that the ruffles were not her original intention. She forgot to add extra length (she is taller than the pattern is cut for – 5 foot 9 – and so usually adds extra to bring the hem down to her knee). So the added ruffles at the bottom were a solution to the problem. And the sleeves frills were added in keeping with the hem to give it a deliberate style. To create this look she cut off 2 inches from the sleeve and then added back 2.5 inches of gathered fabric. 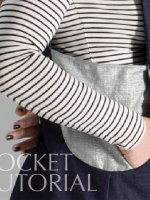 The peek-a-boo pockets are her own invention. She has sliced the pocket pattern pieces to use 2 fabrics so that when the dress lies flat, the dress is one colour but the section below the opening of the pocket hides the fun fabric. The interior fabric is even lighter than the outer fabric to avoid extra weight pulling down and warping the dress. The neckline is another adjustment born from an “Ooops” situation. As she first put the dress together, Mollie felt the dress was a bit big and so took it in to make it slightly smaller – unfortunately very slightly too small in that it pulled fractionally across the bust. To hide this pull she has sewn the flaps open and created a V neckline. I really like this adjustment and it could be easily achieved on any version of the dress. Modern flounces are sweeping the nation and they are a great way to feminise your look usual style without looking too girly. Time to channel your inner Jane Austen romantic and add some frills for a brand new look. 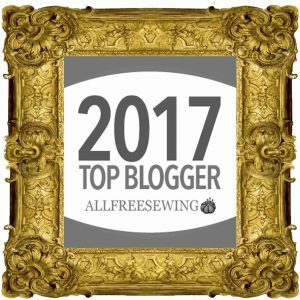 Sew inspiring Molly! For Mollie’s other versions of the Everyday Chic Dress click here.